Writer/director Tim Sutton first made an impression with his directorial debut Pavilion (review), a mesmerizing coming-of-age story which premiered at SXSW in 2012. 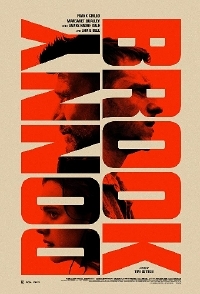 Sutton has made a couple of other films since then but few have caught my attention as much as his latest: Donnybrook. Adapted by Sutton from Frank Bill's debut novel of the same name, the story follows three individuals as they prepare for Donnybrook, a brutal back-woods cage match where participants beat the living daylights out of each other for a chance at $100,000. By many standards that's not a lot of money but for Earl (Jamie Bell), a struggling ex-marine trying to keep his family afloat, Angus (Frank Grillo), a violent, unhinged drug dealer, and Delia (Margaret Qualley), a woman looking to escape her life of crime, it's a shot at a new life. It looks brutal and violent but Donnybrook also seems to have some dramatic chops and could be the kind of backwoods thriller you can sink your teeth into. Donnybrook premiered at TIFF last year. It will open theatrically on February 15 and will be available on VOD February 22.